Unlike a slew of other career options which the aspirants chase so earnestly for their lives, the profession of a sports commentator thrives most on the quality of eloquence, that too, on the quality of extemporaneous, flawless, unparalleled and innovative language along with engaging beauty of the personality. The term ‘sports commentator’ spontaneously evokes before us the image of a person who works as a narrator of the sporting events of cricket, hockey, football and various other games and sports. The main function of a sports commentator is to describe the events of a sporting event live. These celebrity professionals describe the events on radio and comment on televisions to give the vivid picture of what is happening on the playground. Talking with the players, taking their interviews and comments, getting feedback in between the games are also the important jobs which are well performed by a sports commentator. 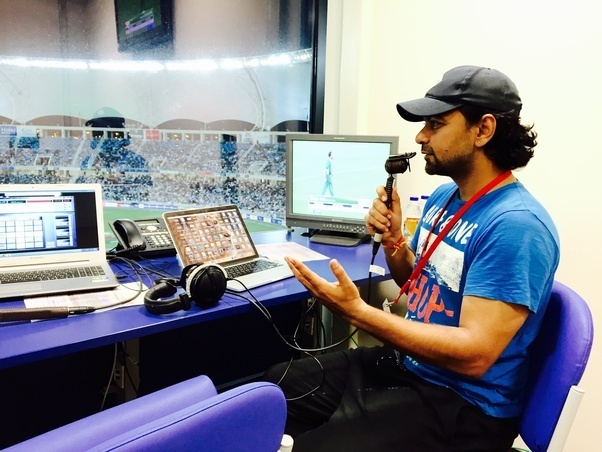 In the post-reformed period of globalization and liberalization of 1990s, sweeping fast across the world, career as a sports commentator has turned out to be very much rewarding, lucrative and interesting career option. 1. A four-year-old bachelor’s degree in broadcasting, communications or journalism is required for the candidates who are interested in the career in this field. 2. Speaking fluently, writing flawlessly and listening very attentively are sine qua non of this field which also make the key skills of this unconventional profession. 3. An appealing personality and familiarity with the broadcast equipments and telecommunication system are specific essential requirements which help make a career in this field. 4. On-the-job-training-experience would provide the candidate the much-needed edge over the rest of the candidates interested in making career in this field. 5. Developing a clear, strong and sweet voice is also one of the important qualities of a sports commentator because voice of a commentator on a radio or television or on a dais dissolves candy in the hearts of the audiences. For this a speech and voice training is very much required. 6. Must have an unquenchable love for sports and immense interest in their players. Besides, a sports commentator aspirant must be a passionate personality dedicated to perform one’s duties even in adverse and odd circumstances. 7. Undying curiosity for updating oneself in various games and sports. 8. Must feel the pleasure and pain of win and defeat of the game yet at the same time must stay indifferent to what comes as a result of the sporting events. 9. Must be emotional stable and able to work under pressure and stresses. 10. Sharp memory to recall the sports statistics and details of bio-data and achievements of various players over the various years. 11. A clear and audible voice. Diction, modulation and intonation must be very flawless. 12. Ability of peppering the commentary with the vital and least-known statistical facts, records and enticing anecdotes during commenting on and off the field. The salary structure and pay package of the sports commentator is sheer the matter of personal experience, fame of the candidate and brand of the hiring broadcasting companies. It sometimes also depends upon the place and country. However, the television commentators are better paid than the radio commentators but, here too, the difference in the salaries is guided by the quality of presentation and the level of the fame of the commentators. In India the entry level remuneration of a sports commentator is Rs. 5000 to Rs, 10, 000 per day. It is another thing that a reputed and well experienced commentator even fetches as high as Rs. 25,000 per day. The candidates, with the earnest desire to make a career in this domain, must start from the internship. Even during the study the aspiring-sports- commentator-students can acquire much-needed experience by working with the sports franchisees, sports organizations, broadcasting companies and news channels. Such an internship also provides opportunities to work with high-profile professionals and thereby one can hone his skills which are needed very much to survive and succeed further in this field. However, experience in this field is very much essential for the growth which can be gained right from starting commenting on the school and college sports events and other sporting events of local areas. Most commentators also start their magnificent career right from sports reporter. But this is not the only universal path of entering into the arena of sports commentator. Many of the veteran sportspersons, athletes and retired coaches work as sports commentators. Presently as per the fast growing trend, the retired cricketers and coaches are donning the role of a cricket commentator and they are also very handsomely paid by the broadcasting companies. However, college may prove to be a very good launching platform to get initiated in this field. Colleges have ‘student radio stations’ and this may give the candidates a golden opportunity to acquire the live broadcast experience. Since this domain of career lacks coaching institutes the candidates who are interested in making the sports commentator as a career must groom themselves for this market of pretty high cut-throat competition. One can undergo courses like that of fluent and very correct-accent English speaking, personality development and communications skills with sweet and audible voice which may provide a candidate an edge over others. A course in sports journalism and the stints as those of anchoring and radio jockeying may considerably help become a professional sports commentator. Though the degrees of mass communication and journalism are considered as the entry eligibility in this segment of the glare of the high publicity and exposure but more than that what a candidate requires most is the personal experience and innovative skills in this field. Working as a commentator on a television channels and describing sporting events which the viewers watch live has now become fashion and the people keep sticking to their televisions until the events are over. In fact, there are two kinds of sports commentators- first is the play-by-play account commentator who is actually called as an announcer. He basically gives account of what is going on the field. The second type of commentator is - Colour commentator. A colour commentator requires to give more than the reporting of what is actually happening on the playground. Besides reporting, a colour commentator is also responsible for giving analysis and insights into what happens on the field. He needs what we may all an encyclopaedic knowledge of the game. While a play-by-play commentator gives report of the activities on the field, a colour commentator’s job is conspicuously concerned with the filling of the gap with the additional and supplementary information and statistics as well as enriching the audiences with history and other lesser-known facts of the games to make the commentary more informative and interesting. There are galore of job opportunities for a sports commentator in radio stations and television broadcasting segments. Radio stations are considered as the entry point to what we may call the gateway to a promising career in the area of sports commentators. With preliminary yet basic experiences in the radio stations one can move to the magical world of various satellite channels of television world. In the beginning one can be assigned the job of giving commentary on some local sporting events for some local radio stations. With this basic experience the employment with the big and famous organizations and that of television channels with high TRP becomes easier. Sports commentators are also employed by the various newspapers, radio stations and TV stations to comment upon what exactly happens on the field. Sports channels like those of Star Sports, ESPN, Ten Sports, Zee Sports and DD employ sports commentators and also provide them handsome remunerations and various other perks. The flip side of the lucrative career of sports commentator is that there is lack of very vast job opportunities in the countries across the world. Yet, one need not be desperate and disappointed, because only your determination, knowledge, experience, will-power, indomitable courage and unfathomable dedication would reach you out to the apex of what the world will call as the best ever sports commentator across the globe.